Call to arrange your no obligation on site survey! We are an MCS accredited installer of Solar PV for domestic, commercial and agricultural as well as Solar Thermal, Air & Ground Source Heat Pumps and Biomass Boilers. Fore most we are electrical contractors, but we specialise in renewable energy installations. Our expertise is in whole house projects that incorporate installing and commissioning under-floor heating, plumbing, electrical and renewables. Barn converion nr stratford-upon-avon following a recommendation from a nearby client, stratford energy solutions were contacted by mr & mrs t. two locations were considered before we designed and installed a 3.78kw array on the rear of their house using 18 x schuco mpe210 modules and an sma invertor with a sunny beam display. included in the installation we carefully re-instated many of the reclaimed quarry tiles as they had become dislodged over the years. estimated annual generation:	3,213kw/h per year. feed-in-tariff income:	â£1,391 per annum. 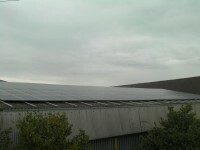 Milcote quality seeds stratford energy solutions were asked to design and install solar photovoltaic panels phase 2 at milcote quality seeds ltd. the remit was to increase the 9.675kw system we had installed in february 2011 to as close to 50kw as possible. this involved using 3 roofs and the addition of a further 184 x schueco mpe215 panels in conjunction with 3 x sma invertors; stp17000tl, stp15000tl & sb5000tl. we also had the additional work of connecting the 3 buildings back to the main meter situated in a fourth building by means of numerous runs of steel wire armoured cable and the installation of 2 new three phase distribution boards. stratford energy solutions managed all aspects from design, communication with western power, the distribution network operator, the customer's own energy company for the installation of an export meter and all installation work. total installed capacity is now 49.235kw. estimated annual generation :	41,926kw/h per year. feed-in-tariff income:	â£13,793 per annum. Stratford marina stratford energy solutions were asked to install solar pv panels as part of the refurbishment/redevelopment of some workshops at stratford marina. 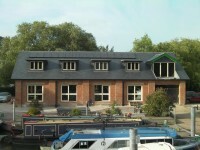 the project involved the ground floor being turned into a coffee shop, office and workshop, with the addition of an apartment in the roof space. we were asked to design an array that integrated into the slate roof. following consultation with our customer kyocera 215w panels were chosen in conjunction with a fronius invertor. estimated annual generation: 2,767kwh/year. feed-in-tariff income: â£1,143 per annum stratford energy solutions are also the main electrical contractor at this site. Stratford Energy Solutions Ltd are MCS accredited engineers who undertake installations of Solar Water Heating and Solar PV. 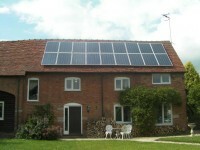 For similar installers in this area please visit the Stratford-Upon-Avon solar page.